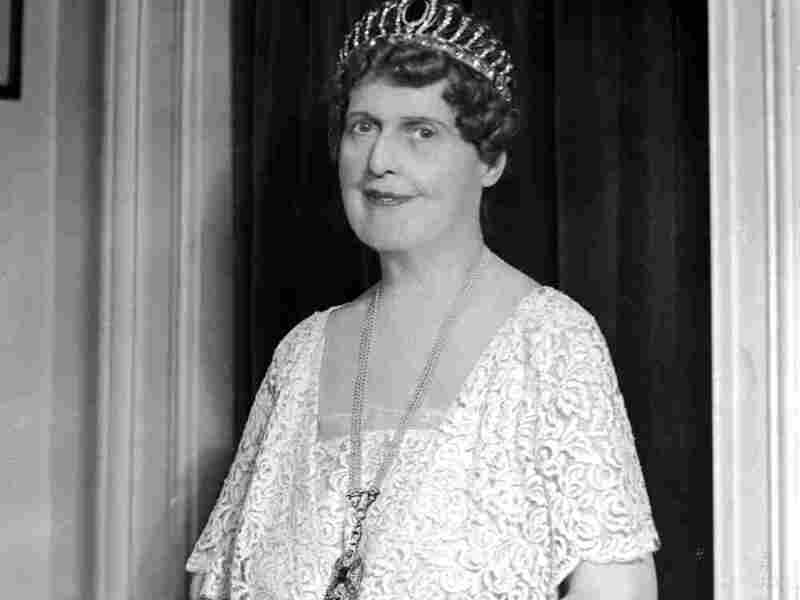 Killing Me Sharply With Her Song: The Improbable Story Of Florence Foster Jenkins : Deceptive Cadence A Manhattan socialite, who sold out Carnegie Hall in 1944 despite having a very dodgy voice, inspired a new movie starring Meryl Streep — and aided generations of actual singers. A new film starring Meryl Streep, which opens in the U.S. Friday, tells the improbable story of Florence Foster Jenkins, a real-life New York socialite who pronounced herself a coloratura soprano despite a distinct lack of talent. Who could've guessed that Jenkins, who favored elaborate costumes and strangled phrases with abandon, would resurface with such gusto decades after her death in 1944. She's been the subject of a Broadway play starring Judy Kaye, a new biography, a documentary and now two movies released in the U.S. within the span of six months. The film, Florence Foster Jenkins, directed by Stephen Frears (My Beautiful Laundrette, Dangerous Liasons, The Queen), is an affectionate portrait of the elderly heiress, her aspirations and her illusions — both as singer and lover — as she ramps up to a Carnegie Hall debut. Thanks to Frears, and a bravura performance by Streep, Jenkins' stock is poised to rise again. A new set of fans will be laughing at the pseudo-soprano's hilarious original 1940s recordings, which have never been out of print yet have just been reissued once more. Jenkins was in her early 70s when she made the records as a vanity project at the Melotone Recording Studio in Manhattan. By this time, she was a visible presence in New York society, having joined dozens of women's clubs, many of which she served as music director. Born into a wealthy Wilkes-Barre, Pa. family in 1868, Jenkins moved to Manhattan after a failed marriage (to Frank Thornton Jenkins, from whom she contracted syphilis) and the death of her father in 1909. As explained in Donald Collop's documentary Florence Foster Jenkins: A World of Her Own, her father had suppressed her dreams of becoming a musician, even after her success playing at the White House as a child. Her mother was more sympathetic, joining her in New York and encouraging her pursuits as a socialite and a singer. Not long after their arrival, Jenkins met St. Clair Bayfield, an unemployed British actor. Bayfield quickly became her perceived lover and the manager of her many social affairs, which included producing musical programs, staging operatic scenes and presenting talented young singers at the many women's clubs. The relationship between Jenkins and Bayfield, complicated by the latter's secret affair and the fact that the two never lived together, gets tender treatment in Frears' film, thanks to a nuanced performance by Hugh Grant. Jenkins took singing lessons and little by little began to perform at her clubs, at invitation-only recitals at Manhattan's Ritz-Carlton and as far afield as Newport, R.I. and Washington, D.C. No serious music critics reviewed these performances. In some trade papers like the Musical Courier, however, notices were surprisingly positive. Some said these might have been penned by the singer's friends or Jenkins herself. That brings to the front some inevitable questions: Did Jenkins understand how badly she sang, and were her friends and patrons genuinely enthusiastic or just humoring her? Frears' movie portrays her associates as protective and Jenkins as oblivious. But acclaimed voice teacher Bill Schuman, who has a compelling connection to Jenkins, says she was too smart. "There's no way she could not have known," Schuman said in a telephone interview. "No one is that unaware, especially a person who has developed so much of her time and resources to helping young, really good singers." One of those young singers Jenkins supported was Louise Frances Bickford, who later became Schuman's teacher and steered him toward his current profession. Bickford "said that Florence was in on the joke," Schuman said. "She loved the audience reaction and she loved singing. But she knew." Mezzo-soprano Marilyn Horne isn't so sure. "I would say that she maybe didn't know," Horne said by phone from her home in Santa Barbara, Calif. "First of all, we can't hear ourselves as others hear us. We have to go by a series of sensations. We have to feel where it is." Like hearing an off-key whistler on the street, apparently deaf to errant tones, we can't always tell how good or bad we sound. Schuman said the inability to hear pitches correctly is not uncommon: "One of the greatest instruments I ever had the honor of teaching unfortunately had a faulty ear. It couldn't be corrected and it stopped his career. The voice was unbelievable, but the ear was faulty." Then there's the issue of Jenkins' illness, which is also addressed in the film. A long-term syphilis patient, she took regular does of mercury and arsenic, two routine remedies of the day, according to Collop. "It affected her hearing," he told CBS Sunday Morning. "And more than likely she had tinnitus, which is a constant hum in her head. It prevented her from singing in tune." No matter what the cause, the voice itself, and what Jenkins did with it, is startling. Horne, who first heard Jenkins' recordings when she was in her 20s, said that if someone like her would show up at a master class, she'd tell her to "go home." Florence Foster Jenkins Sings "Der Hölle Rache" from Mozart's The Magic Flute. Diana Damrau sings Mozart's "Der Hölle Rache' as it should be sung. "No," Horne added, chuckling, "I would kindly tell her that I think she ought to look elsewhere for her musical kicks, however she wanted them." Horne believes some people are blessed with good voices, others not so much. "They call it a gift," she said. "To have a great voice, usually — and I would say 99 percent of the time — you have to be born with it." Was a voice like Jenkins' salvageable at all? Schuman says that in Mozart's Queen of the Night aria, what Jenkins gets wrong comes down to a single word: everything. "There's no way to even pedagogically discuss it," he added. "It's amazing that she's even attempting to sing that music." For the movie, Streep, a trained singer, attempted an imitation of Jenkins' Mozart aria more often that she might have liked. "I sang it eight times one day," she told an audience at New York's 92nd Street Y. "And then came back and sang it eight times the next day." For British morning television, Streep described what Jenkins did on her recordings: "She'd go off in the weirdest places and it was the particularity of her getting things wrong that was so funny. You can hear her getting ready to sing something and she spends all of her voice on the beginning of the phrase and there's nothing left at the end and she trails off." Whether Jenkins was in on the joke or not, she ultimately might have the last laugh. Although there have been musical humorists for centuries (see Mozart's A Musical Joke), Jenkins' fame was followed by a virtual cottage industry of mid-century comedic musicians who performed badly for laughs. Perhaps the most apropos example is Michael Flanders and Donald Swann's "A Word on My Ear," a song about a tone-deaf diva from around 1950. Among the best was the team of singer Jo Stafford and her husband, the pianist and arranger Paul Weston. Beginning in 1957, as Jonathan and Darlene Edwards, they cut a series of wickedly funny and purposefully terrible recordings. That same year saw the release of Music to Suffer By from Leona Anderson, a wobbly-voiced former silent film actress, while in 1960, Mrs. Miller's ear-warping renditions of songs like "Downtown" and "A Hard Day's Night" began to appear. Unlikely as it may seem for someone routinely hailed as the world's worst singer, Jenkins has a legacy that lives on in some of today's finest opera artists. One could argue that had Jenkins not sponsored Bickford all those years ago, Schuman might have taken quite a different path. And if that's so, who knows where some his award-winning students would be. Beginning in 2009 Schuman's protégés won the prestigious Richard Tucker Award four years in a row — tenors Stephen Costello and James Valenti, and sopranos Angela Meade and Ailyn Pérez. Jenkins finally decided to go big time in 1944 when she rented Carnegie Hall, giving her first truly public recital Oct. 25. By this time her fame in New York was widespread and the hall was filled to capacity, including luminaries like Cole Porter, Gian Carlo Menotti, Lily Pons, Andre Kostelanetz, Tallulah Bankhead and Kitty Carlisle. The following day in the New York Post, gossip and entertainment columnist Earl Wilson wrote that the concert was "one of the weirdest mass jokes New York has ever seen." It's not entirely clear whether such words crushed Jenkins or not. In Frears' film, we're to believe the review essentially killed her off the next day. In real life, Jenkins suffered a heart attack five days later while shopping in G. Schirmer's music store. She died a month after her Carnegie performance, on Nov. 26, at age 76. Somehow, Jenkins' story still resonates. For Horne, a lot of it has to do with humor: "I think it's because she was so outrageous, right? She put herself out there and people like to laugh, and that's what it's all about." Schuman thinks Jenkins may trigger the amateur and the fantasist in all of us. "I think everyone's an aspiring singer," he said. "You look at American Idol, you look at all those auditions." And then there's Schuman's personal connection. "I wish we could go back and meet her," Schuman said. "I just know that my teacher loved her as a person and admired her. She changed my teacher's whole life, so I owe her, actually, my teaching career. Because of her, my life's changed and many generations of singers. So, if that's her impact, that's an incredible impact."